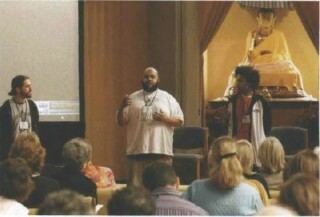 Andres Gonzalez, Ali Shah Rasool Smith and Atman Ananda Smith, co-founders of the Holistic Life Foundation, at the Garrison Institute’s Education Symposium. HLF works with severely at-risk youth in East Baltimore, offering yoga and meditation in after school programs, and is involved in a study of the effects of the meditation on children’s cognitive, attentional, coping, academic, and behavioral skills. It’s no secret that American schools are facing a crisis. Academically students lag behind their peers in other industrialized nations and the drop-out rate is escalating, as are the numbers who have learning and mental health problems that put them at risk of developing serious disorders. Increasing numbers of educators are exploring the use of contemplative or mindfulness-based methods to reduce teacher and student stress, enhance classroom climate and students’ ability to focus their attention and to promote care and concern for others.